Mexican food and Indian food are so similar in many ways. They both use a lot of spices, whole grains and dried beans. 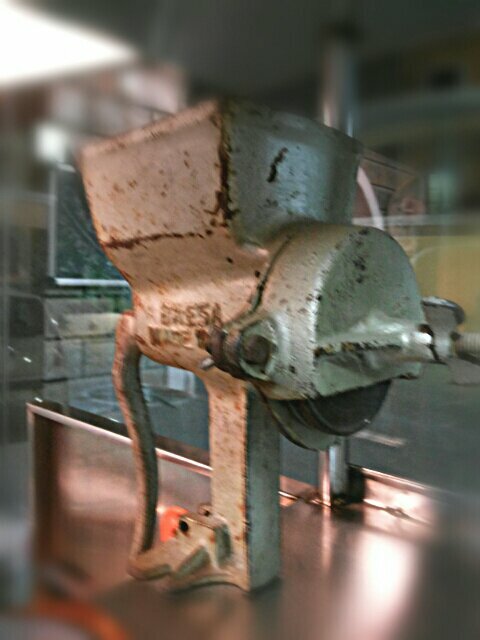 The use of fresh produce is also prominent, even though a lot of the food has meat. Of course, what I am referring to as ‘Mexican Food’ is actually the more popular ‘Tex-Mex Food.’ It tastes delicious and blends into our Indian palate well. It does surprise me that it is not more popular in India. We have some wonderful restaurants that serve good and more or less authentic Tex-Mex food like Sancho’s in Bombay, which is a huge favorite of ours. 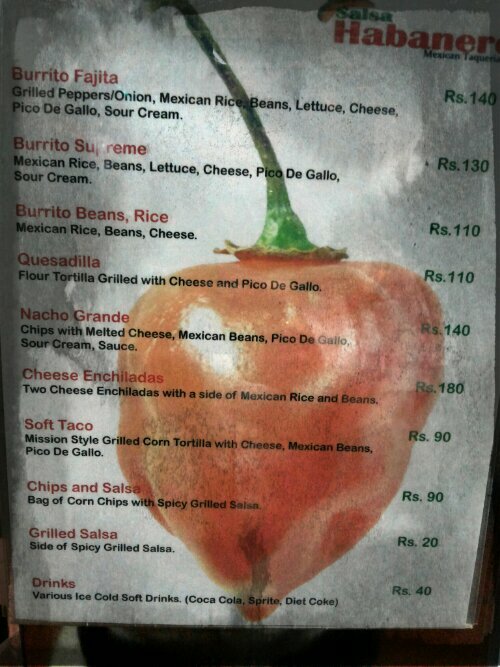 I was very happy when I found out there is someone in Baroda who makes authentic burritos and a few other Mexican dishes. S, and so many of his friends, kept raving about his food. He only serves on weekends and I was never there for some reason on weekends. 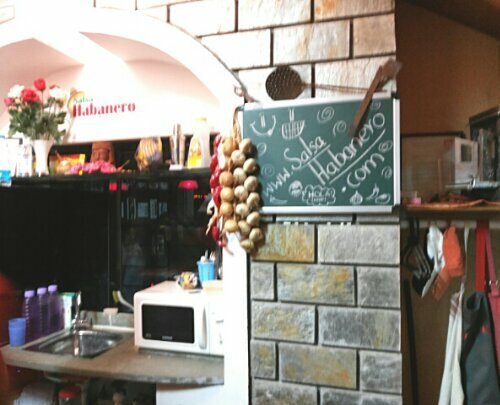 I finally got a chance to visit Salsa Habanero, a Mexican Taqueria, a few weeks ago. To be honest, everyone just referred to him as Paco; so when I saw the board for Salsa Habanero, I was a little surprised. The entrance is a cute little metal door, which is a part of the owner’s house. 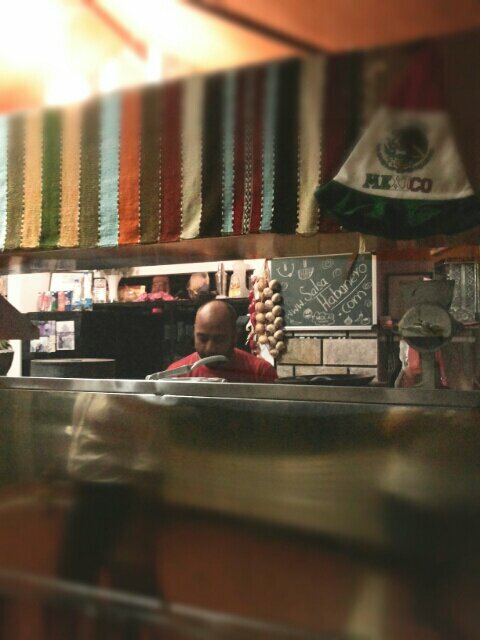 He has created a small open kitchen where you watch while Chef Paco makes your food right in front of you! Such an exciting and wonderful experience! It is always a delight to have a conversation with both Prakash and Rita. I found it very interesting that they are trying to grow Avocados and do grow habanero chilies themselves. Habanero chilies are some of the spiciest in the world and Tabasco has a Habanero chili flavor. All I can say is, it is NOT for the weak of the tongue. But used correctly (and sparingly), they add so much flavor to the food! Yummm! 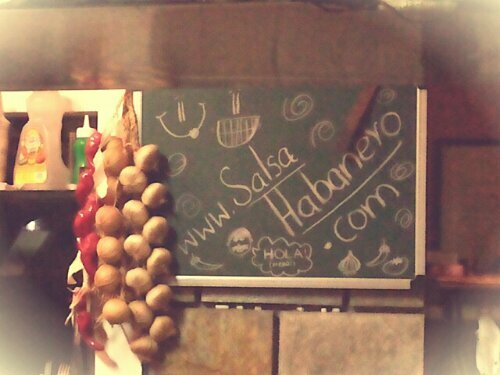 But lets talk about Salsa Habanero and their food. It is every bit as good as everyone had been saying it was! I couldn’t believe I hadn’t had a chance to try it sooner! After a long time, I ate real Mexican food with authentic flavors. It seems like he does use authentic vegetables and spices that are traditionally used in Mexican food. Allow me to digress for a second. A Taqueria is a small Mexican restaurant that would specialize in tacos and/or burritos. To those who like to try something new all the time and want a large, extensive menu, you will be a little disappointed with the variety offered. But rest assured, once you try the food, there is no turning back. You will keep going for more! Paco offers 3 different kinds of burritos, Nachos, soft tacos, enchiladas, quesadillas, a very spicy salsa and a tortilla basket. The burritos are exactly the kind that they serve in the US. Huge and completely well filled. One burrito is more than enough for one person and I normally can’t even finish mine! They are beautifully stuffed with Mexican rice, beans and the stuffing you have decided upon. He adds some cheese and sour cream to it and rolls it up. I wish he would have a workshop where he would show you how to roll up a perfect burrito. I always seem to make a mess when I try to make them at home. Next is the Nachos Grande. True to their name, they are grand and loaded with beans, chips, cheese, sour cream and some Pico de Gallo. Delicious and a delightful treat! They taste best when they are eaten super fresh and I doubt you’ll want to share them. The tortilla basket was something we tried recently and really enjoyed it because of all the fresh lettuce in there. The basket itself stayed quite crisp because it was slightly on the thicker side. Had it been thinner, it would have become quite soggy from the entire filling. The soft tacos weren’t my favorite and I didn’t enjoy them as much only because I felt I could’ve done with more freshness in them. 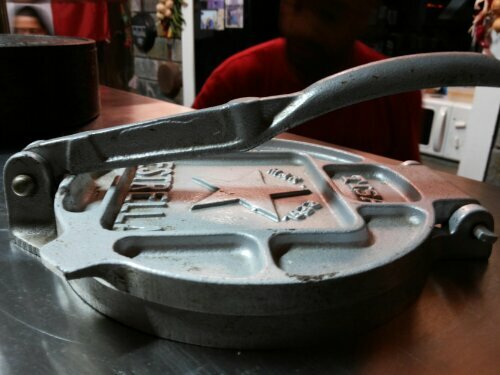 We have had the enchiladas on occasion and once you get them heated up perfectly, they taste wonderful! They come packed separately and Rita helps you understand how to heat them up to ensure you get the best out of them. The sauce has a wonderful smoky flavor to it and the beans and rice on the side taste wonderful. Now that I think of it, a lot of his vegetables, sauces and salsa have this gorgeous smoked flavor. I love that about his food! I think that is only possible when you make smaller quantities so you can maintain the consistency and quality of your food. I almost forgot about the grilled salsa! The vegetable are grilled in it too and lend a gorgeous flavor, but let me warn you, it is spicy! Well, then again, I’m not very good with spicy food so I find it a little too spicy, but I love the flavors so much! It ‘jazzes’ up all the food and I tend to keep a little to eat with chips the next day. What I think I love most about Salsa Habanero is that he uses fresh produce. It also makes me content to know that his stuff will not have artificial preservatives. I love the whole experience and the uniqueness of it. Where in India would you find such a concept where the chef is not interested in commercial gains? Paco genuinely seems to enjoy sharing his food and feeding others. Even though you end up being there for hardly 15 minutes, watching him and talking to him gets you inspired. I love their entire set up and it is definitely the next big concept in food. Salsa Habanero is only open for takeaways on the weekend between 6 pm to 10 pm. You must call them beforehand to let them know of your order and then choose a pick up time that is convenient to both parties. If you are from Baroda and enjoy authentic Mexican food, YOU HAVE TO GO HERE! I hate sounding like a groupie but its just so yummy! I need to go back next weekend to take better pictures of Paco and his yummy food, at least that is what my excuse is going to be! 😉 I am excited to begin my maiden restaurants in Baroda review with Salsa Habanero. Do let me know what you think about Salsa Habanero. Ah. my first rendezvous with Mexican food. Wasn’t it a wonderful experience ??!! Aw, man! I’ve been a faithful Salsa Habanero patron since it first started. I love Prakash and Rita! With Salsa Habanero, it’s really about them. It’s like they’re amazing and oh yeah, the food is great, too. Now I’ve relocated to Bangalore and I miss them. Also, the food. Glad you got the take in the experience. I hope you get to go there more often. Lovely review. I’m missing the Patels and also, salivating now. It is completely amazing! As you have probably read, I just love them and their food. I hope this concept catches on and we enjoy wonderful food from people are really passionate about cooking. Thank you for your awesome comment and let me know if there are any other exciting places in Baroda since I just moved here!